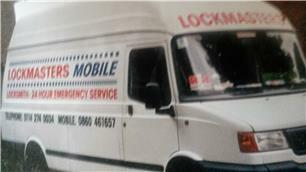 Lockmasters Mobile - Locksmith based in Sheffield, South Yorkshire. We are 24 hour locksmiths here to help. We are pleased to do domestic and business work. Experienced with over 25 years in the locksmith trade. Company formed in 1989. Upvc snap-secure cylinders fitted as standard. Lock changes and repair. If you are locked out we can help you.